The globetrotting Beckhams are back in Los Angeles and making the most of the Summer! David and Victoria were photographed enjoying a family day out with their four children at Disneyland in California on Thursday. David manned the camera while the family rode the carousel. 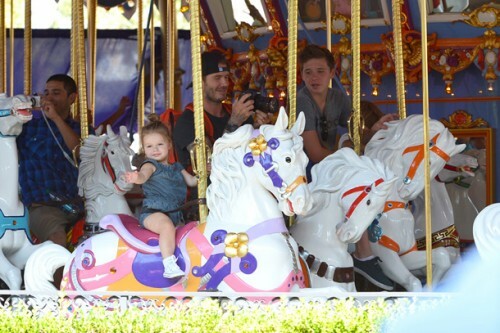 Now two, Harper was super cute in a denim jumper and Converse hightops as she rode the horsie on her own. 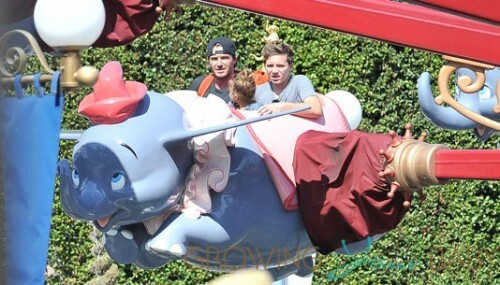 Brooklyn kept his eye on his baby sister as the family made their way through the park and also kept her close while they rode on Dumbo. In January the family, who called Los Angeles home for five years, relocated to London while David played for Paris St. Germain. Well known for looking unimpressed in most photos, Victoria also revealed that she does smile, just not for the photogs. Kanye West Shows Off Baby North!